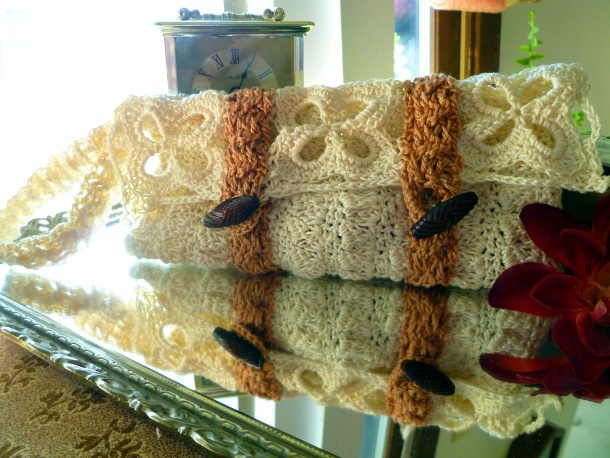 One day I was looking through a magazine that had a crochet clutch in it. It was priced at 250 dollars. I was speechless and surprised at such a price. I knew I could design and make one that looked very similar and that it would only cost me about ten dollars and 10 hours to make. The end result is the pattern below. (FYI, I bought the thread on sale so I only spent 7.50 on the clutch, and it probably only took 3 hours.) There are three main elements to the clutch, the flap, the clutch, and the button straps, all three of these can be one solid color, or you can make all three components different colors, I found both ways look great. Picot: Ch 4, sl st in st just made. Note: The clutch is started at front flap and worked in one piece, with the button straps added last. Rnd 2: Ch 1, *make 12 sc in ch 8 space. * Repeat from * to * 3 times, slip stitch into starting sc. Rnd 3: Slip st into sc and next sc, ch 1, 1 sc in st just used, sc in next 3 sc, 2 dc in next 2 sc, sc in next 4 dc, skip 2 sc. * Sc in next 4 sc, 2 dc in next two sc, sc in next 4 sc, skip 2 sc. * Repeat from * to * 2 times, sl st into starting sc. Rnd 4: Working in back loops only, sl st into sc and next sc, ch 1, 1 sc in st just used, sc in next st, [1 hdc and 1 dc] in next dc, picot, 1 dc and 1 hdc in next dc, sc in next 2 st, skip 6 sc, ch 6. *Sc in next 2 st, [1 hdc and 1 dc] in next dc, picot, [1 dc and 1 hdc] in next dc, sc in next 2 st, skip 6 sc, ch 6. * Repeat from * to * two times, sl st into beginning sc. Finish off. Rnd 1- 3: Follow the pattern for first flower motif. Rnd 4: Working in back loops only, sl st into sc and next sc, ch 1, 1 sc in st just used, sc in next st, [1 hdc and 1 dc] in next dc, 1 joining picot, [1 dc and 1 hdc] in next dc, sc in next 2 st, skip 6 sc, ch 3, joining ch, ch 2, sc in next 2 st, 1 hdc and 1 dc in next dc, 1 joining picot, [1 dc and 1 hdc] in next dc, sc in next 2 st, skip 6 sc, ch 6. *Sc in next 2 st, [1 hdc and 1 dc] in next dc, 1 picot, [1 dc and 1 hdc] in next dc, sc in next 2 st, skip 6 sc, ch 6. * Repeat * to * 1 time, sl st into beginning sc. Finish off. Row 2: Ch 3, turn, 1 dc in same st, *[1 sc, 1hdc, and 1 dc] in post of dc just made, skip 2 sc, 1 sc in next st, 1 hdc in next st, 1 dc in next st.* Repeat from * to * to end. Row 3: Ch 1, turn *sc in dc, hdc in hdc, dc in sc, [1 sc, 1 hdc, and 1 dc] in post of dc just made, skip 3 stitches. * Repeat from * to * to end, sc in dc. Row 4: Ch 3, turn, 1 dc in same st, *[1 sc, 1 hdc, 1 dc] in post of dc just made, skip the sideways dc, sc in dc, hdc in hdc, dc in sc. * Repeat from * to *. Repeat rows 3 and 4 till it is 8 inches in height or desired length. Finish off. Row 3: Ch 3, skip 2 fpdc, bpdc in next 2 fpdc, bpdc in skipped fpdc, dc in 3rd ch of previous row. Repeat rows 2 and 3 till it is 9 inches or desired length. Ch 6, sl st into first st of last row, ch 1, turn, sc evenly around ch. Finish off. For optional wrist strap, make just like button straps without the chain and sc on the end. pocket and whip stitch up the two sides. Sew on the buttons where the button loops fall. Sew on the wrist strap. Julia Schwartz is the wife of a seminary student, a mother of a two year old daughter, and a daughter of a long line of crafters. She has been sewing since she was five, cross stitching since she was ten. 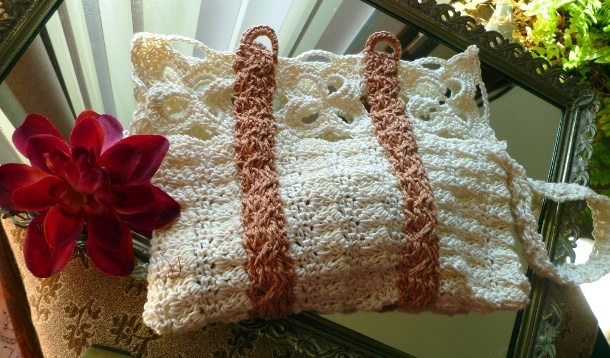 She picked up crocheting and knitting in college. 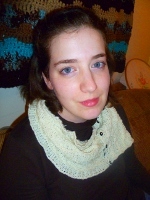 She also enjoys cooking, card making, and painting, but her true love will always be crocheting. You can keep up with her on her blog at designsbydiligence.blogspot.com . Beautiful! I am so pleased to see your idea tured out so very well. I love thread crochet and this is a prime example why.